É muito bacana ver o quanto Si gung gosta de Si Baak Paulo, e o quanto Si Baak Paulo sempre se refere a Si Gung com grande respeito e admiração. Digo isso, porque no ano de 2012, tive o privilégio de fazer minhas sessões de Baat Jaam Do com Si Baak e sempre o ouvia se referir a Si Gung dessa maneira. Praticar com alguém com tanta experiência e habilidade, para mim foi motivo de muita alegria, pois em determinados momentos, tudo o que eu queria era não atrapalhá-lo com meu Kung Fu mediano. Quinta-feira é dia de matérias de nosso Clã na mídia aqui no BLOG,então acompanhe uma entrevista dada por Si Baak a uma revista brasileira de artes marciais na década de 90. Um inspirador relato de alguém que ama as artes marciais e seu mestre, em especial, o Ving Tsun e Mestre Leo Imamura! Si Baak and always heard him refer to Si Gung this way. 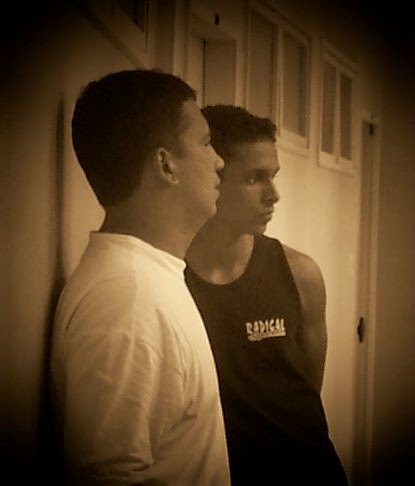 Practice with someone with so much experience and skill, to me was cause for joy, for in certain moments, all I wanted was to not bother him with my poor Kung Fu. 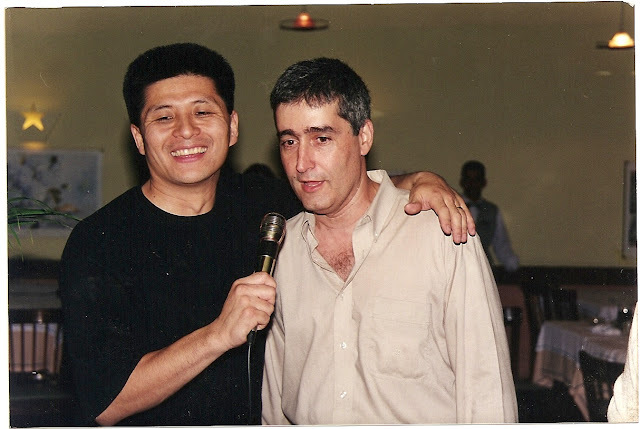 Thursday is the day to put on line magazine reviews of our clan here in BLOG, so read an interview given by Si Baak to a Brazilian martial arts magazine in the 90s. 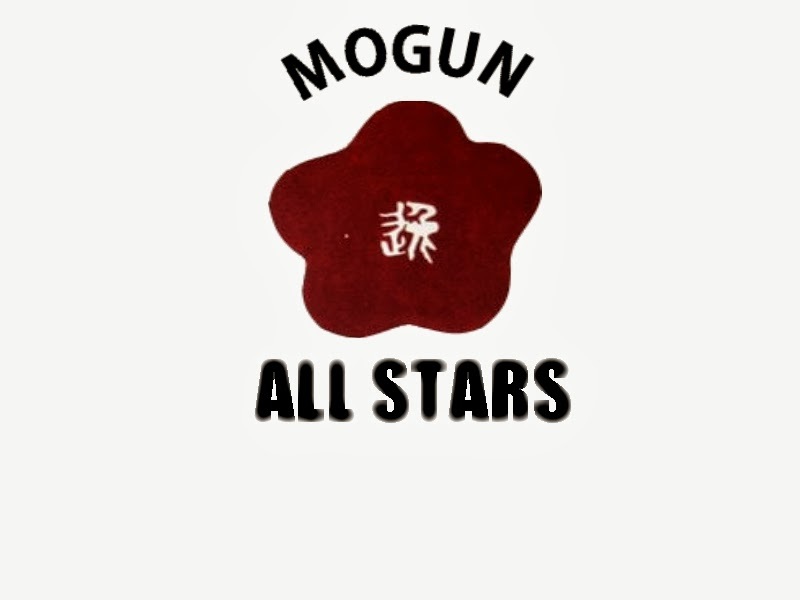 An inspiring story of someone who loves the martial arts and his master, in particular, the Ving Tsun and Master Leo Imamura! And in this regard he tells us why he took Ving Tsun for real and what this art influenced his new journey of life. "What is the point to start practicing a martial art at 28 years old? This question does not get out of my head after watching an interview with Master Leo Imamura on a talk show on TV here in Rio de Janeiro. 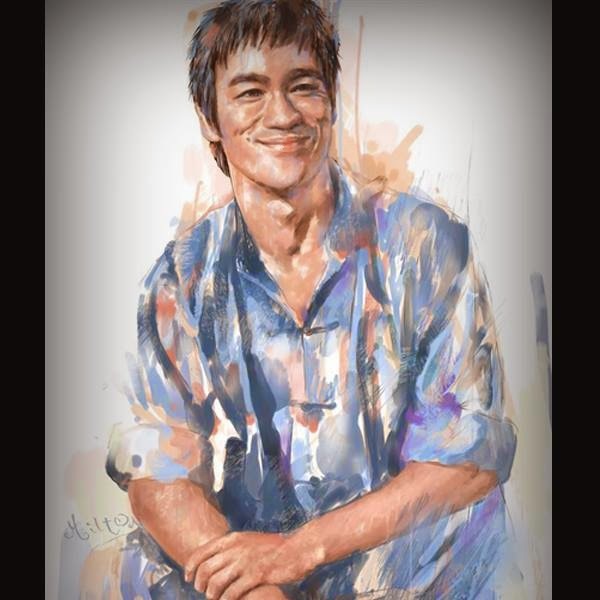 He spoke of a martial art called VING TSUN that had been practiced by Bruce Lee and was the more traditional chinese martial art practiced throughout the world. 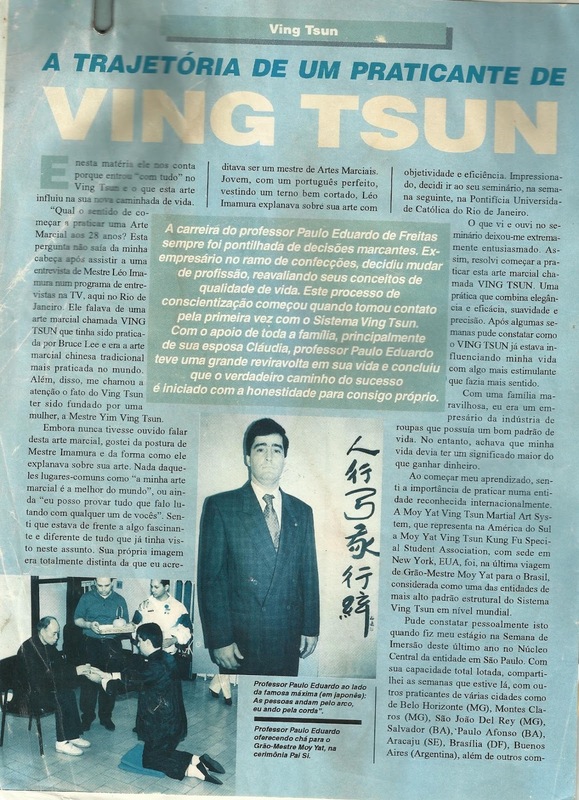 Furthermore, caught my attention the fact that the Ving Tsun was founded by a woman, the Master Yim Ving Tsun. Though I had never heard of this martial art, enjoyed his posture and how he expounded on his art. None of those commonplaces as "my martial art is the best in the world", or "I can prove everything I say fighting with any of you." I felt I was facing something fascinating and unlike anything I had already seen on this subject. His own picture was totally different from what I believed to be a martial arts master. Young , with a perfect Portuguese and wearing a well-cut suit, Leo Imamura expounded on his art with objectivity and efficiency. Impressed, I decided to go to his workshop, the following week,at the Pontifical Catholic University of Rio de Janeiro. What I saw and heard at the seminar left me extremely excited. So, I decided to start practicing this martial art called VING TSUN. A practice that combines elegance and efficiency, smoothness and accuracy. After a few weeks I could see how VING TSUN was already influencing my life with something more estimulating that made more sense. With a wonderful family, I was an business man who owned a clothing industry with a good standard of living. However, I thought my life should have more meaning than making money. When starting my apprenticeship, I felt the importance of practicing in an internationally recognized entity. 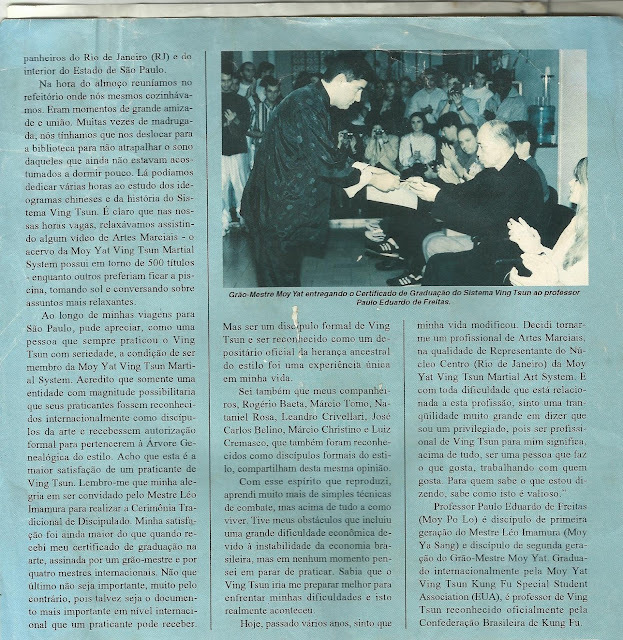 The Moy Yat Ving Tsun Martial Art System, which is in South America representing Moy Yat Ving Tsun Special Student Association, based in New York, USA, was during the last trip of Grand Master Moy Yat to Brazil, considered as a entities of highest standard structural on a global level. I witnessed this personally when I did my internship during the "Immersion Week" this past year in the MYVT Brazil Headquarters in São Paulo. Crowded to its full capacity, shared the weeks I was there, with other practitioners from various cities like Belo Horizonte (MG), Montes Claros (MG), Sao Joao Del Rey (MG), Salvador (BA), Paulo Afonso (BA) , Aracaju (SE), Brasilia (DF), Buenos Aires (ARG), and other companions of Rio de Janeiro (RJ) and in the state of São Paulo. At lunch time in the kitchen where we gathered ourselves We cooked. There were moments of great friendship . Often at dawn, we had to move in to the library to not disrupt the sleep of those who were not yet accustomed to sleep. There We could devote several hours to the study of Chinese characters and the history of the Ving Tsun system. It is clear that in our spare time, we could relax watching some video of Martial Arts - the collection of Moy Yat Ving Tsun Martial Art System has around 500 titles - while others preferred to go to the pool, sunbathing and talking about more relaxing things. 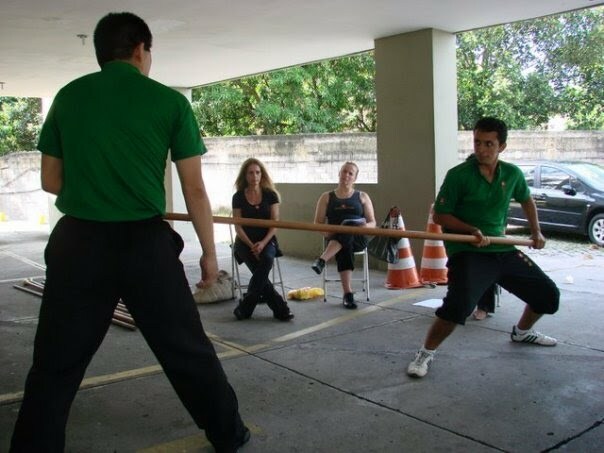 Throughout my travels to São Paulo, I could appreciate as a person who always practiced Ving Tsun seriously, the condition of being a member of the Moy Yat Ving Tsun Martial Art System. I believe that only an entity with magnitude would enable its practitioners to be recognized internationally as disciples of the art and received formal authorization to belong to the Family Tree style. I think this is the greatest satisfaction of a Ving Tsun practitioner. I remember my joy at being invited by Master Leo Imamura for Traditional Disciple Ceremony(Baai Si).My satisfaction was higher than when I received my graduate certificate in art, signed by a grand master and 4 international masters. Not that the latter is not important, quite the contrary, it is perhaps the most important document in international level that a practitioner can receive. But being a formal disciple and be recognized as an official depository of ancestral heritage of Ving Tsun style was a unique experience in my life. I also know that my companions: Rogerio Baeta, Marcio Tomo, Nataniel Rosa, Leandro Crivellari, José Carlos Belino, Christiano and Márcio Luiz Cremasco, which were also recognized as disciples share this same opinion. With this spirit I learned much more than simple fighting techniques, but above all how to live. 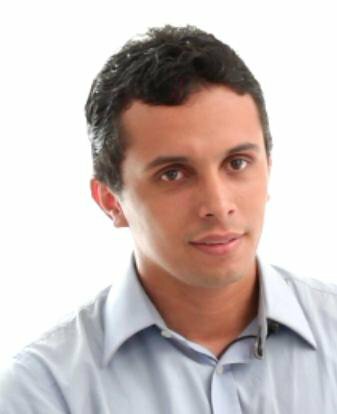 I had my obstacles that included a major difficulty due to economic instability of the Brazilian economy, but at no time thought to stop practicing. Knew the Ving Tsun would better prepare me to face my difficulties and this really happened. Today, after several years, I feel that my life changed. I decided to become a professional Martial Arts, as the Representative of the Moy Yat Ving Tsun in Rio de Janeiro Downtown . And with all the trouble that is related to this profession, I feel a very great tranquility to say that I am privileged to be as a Ving Tsun professional to me, means above all, be a person who does what likes, who likes the people who works with . For those who know what I'm saying, you know how it is valuable. Paulo Eduardo Freitas (Moy Ba Lo) is first generation disciple of Master Leo Imamura (Moy Yat Sang) and second-generation disciple of Grandmaster Moy Yat. Graduated internationally by Moy Yat Ving Tsun Kung Fu Special Student Association (USA),Ving Tsun professional officially recognized by the Brazilian Kung Fu Confederation.